Korea and California as Islands. 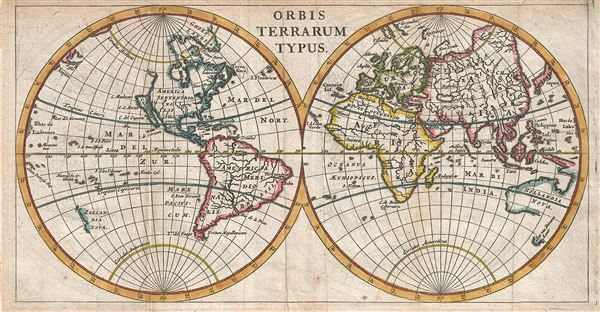 A scarce and attractive 1661 miniature map of the world by Philipp Cluver. Cluver presented the world according to the geographical conventions of the time with California and Korea appearing in insular form. In South America, Lake Parima, mythical site of El Dorado according to Sir Walter Raleigh, is shown but not textually identified. In Asia, the Caspian Sea is erroneously rendered on a north-south axis. The Nile follows the Ptolemaic Two Lakes Theory but curiously connects to the various rivers of the Congo. The coast lines of Australia (Hollandia Nova), Tasmania (Van Diemens Lant) and New Zealand (Zeelandia Nova) are only partially filled in giving evidence to extremely limited reconnaissance available with regard to the South Pacific. This map was issued for the 1661 edition of Cluver's Introductionis in Uniersam Geographiam. Very good. Original fold lines. Original platemark visible. Some transference. Blank on verso. Shirley, Rodney W., The Mapping of the World: Early Printed World Maps 1472-1700, no. 407, page 431.